Midwestern and Southeastern United States. Fourth in a series by Anne W. Anderson (the other half of we), who visited with each of the studio owners hosting the 2014 Tampa Bay Tour de Clay, a self-directed series of stops stretching from Palm Harbor to San Antonio. It’s the middle of September and Kim Wellman-Welsch and Harry Welsch, owners of Wellman and Welsch Pottery in Lutz, have just returned from working at their summer studio in Michigan and from making the rounds of juried art shows and festivals in more northern states. Daughter Adrienne Wellman-Welsch, who keeps the Florida studio running when they are gone, and Phoebe, the dark gray studio cat, are helping them settle back in. Not for long, however. In two weeks, they’ll head to Louisville, Kentucky, for the St. James Court Art Show, then appear in Winter Park the following weekend and in Ocala two weekends after that. In between, they produce the thousands of pieces of work they sell in a year. This, along with Welsch’s teaching high school physics, has been their life for almost 40 years. Somewhere along the line, the line between “her pottery” and “his pottery” blurred, then disappeared. He/she would start a piece; he/she would trim it and finish it; together they would fire, glaze, and fire again. For the last few years, a third pair of hands—daughter Adrienne’s—has joined the chain from wheel to table to kiln to shelf. Their son lives in Orlando. Kim Wellman-Welsch may have started the wheel turning, as it were, by taking a pottery class from a friend back in the mid-1970s. But Harry Welsch kept the wheel turning and the kiln firing. In fact, he built the first wheel and kiln. “That was about the time Adrienne was born and everyone was hippies,” says Wellman-Welsch with a laugh, referring to the revival of interest in the handcrafts during that period. She sewed and had taken basket weaving and loom weaving classes, and she was working for the phone company in Bradenton. Working with clay sounded like fun, so she accepted her friend’s invitation, not knowing how radically it would alter their lives. the living and the life-giving. So Welsch built a kiln—the first of many, as it turned out. But he knew what he was doing. “The first serious job I had was setting up travel trailers—doing the wiring, plumbing, and other construction,” says Welsch, who also has made all the work tables in the studio and some of their home furniture. It also didn’t hurt that he had studied physics, along with chemistry and biology, in college. “I built her first clay wheel from a physicist’s perspective,” Welsch says, speaking of the forces working on the clay as it spins. The faster the wheel spins, the more tendency there is for the clay to be pulled off center and to fly off the wheel or, if perfectly centered, to flatten and spread evenly toward the edges. The potter’s job is to counter the force of the spinning wheel, keep the clay centered, and draw the clay inward and upward. Once the clay is evenly centered, then the potter must control the rate at which the piece is opened and at which the walls are pulled outward and upward. Before long, Welsch was sitting down at the wheel, too. Then people started buying their work. “One day, she just told the phone company, ‘I quit,’ which appalled our parents,” says Welsch. Wellman-Welsch says she finds centering the clay very calming. “It’s the feeling in the flow of the clay,” Adrienne adds, as her mother picks up a finished mug and cradles it in her hands. The mug Wellman-Welsch holds isn’t the non-descript, smooth-sided coffee shop variety. This mug, glazed seafoam green on the bottom and sky blue on the top, grows smoothly from the base then bulges outward toward the midsection. “It gives a more tactile experience for whoever is using it,” Wellman-Welsch says. from its base and fans out near the top. out to sea by the aquamarine undertow. distortions, spin them around in their hands,” Welsch says. “They feel good to us,” Wellman-Welsch begins. “And we want them to feel good to others,” Welsch finishes. 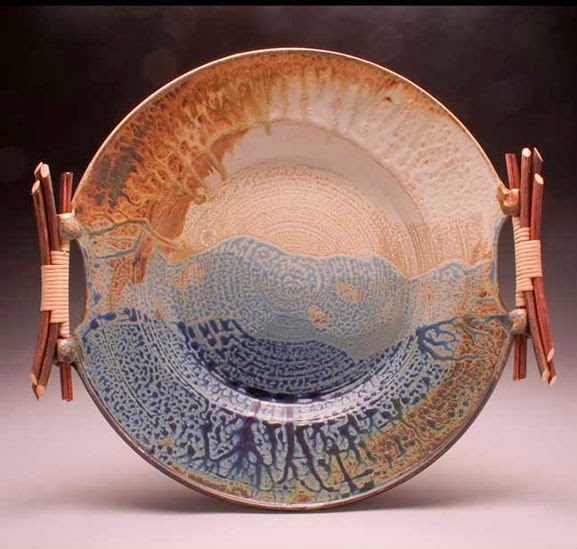 Part of the Wellman and Welsch artistry is in adding visual and tactile layers to seemingly simple pieces like mugs and bowls. Another part is in the melding of natural elements, especially in the larger-form pieces they create. Attachments formed into the clay pieces hold, after firing, handles of wrapped reeds, bamboo, tree branches, and other natural items, linking the wood and reeds with the earthy clay from which the organic matter grew. The glazes in shades of blues and browns and sands and greens flow into and around and through each other, recalling the intertwining of earth and sky and stream and sea and woods and marsh and desert. The two may have been “naturals” when it came to pottery, but Welsch’s thirst for knowledge took them, in the late 1980s, to Rochester, New York, where he earned an M.F.A. They returned to this area, thinking Welsch might find a position teaching art. Instead, he became the physics teacher at Chamberlain High School. Tour-goers following the south-to-north route will find Wellman and Welsch Pottery listed as the fourth stop. 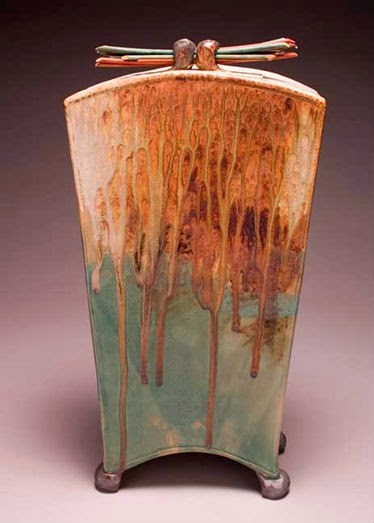 Guest artists John Kellum, Laurie Landry, Charlie Parker, and Matt Schiemann will display their work on the grounds, and a 3 p.m. kiln opening is scheduled on Saturday. Look for Wellman and Welsch Pottery online at www.wellmanandwelschpottery.com.